This week on The Library with Tim Einenkel, Tim continues his conversation with legendary Evil Dee. Evil Dee talks about how Rawkus Records could have succeeded, learning the business aspect of the music industry, Black Moon’s history, Beatminez Radio history, embracing technological development as a DJ and a new Black Moon Album. 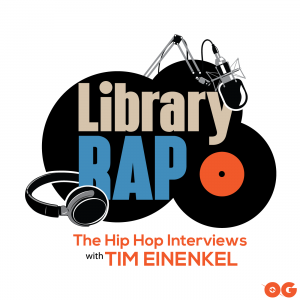 This week on The Library with Tim Einenkel, Albany, GA artist, Cantrell. The Mass Appeal artist talks his early beginnings Jam Skating in Georgia, lessons learned from Nas, his mom’s music, breaks down his lyrics, his new album Devil Never Even Lived and much more. This week on The Library with Tim Einenkel, Tim sits down with two legends, Grandmaster Caz and Grandmaster Melle Mel. The progenitors of hip hop talk about what inspired them, Top Shelf records and the media tour, what differentiated them from others and share some great hip hop history.